Aussie Pack ‘n’ Ship is a slick, cost-effective program for working out how your primary (inner) pack can be best oriented into a box, in a quantity and configuration that best suits your needs. 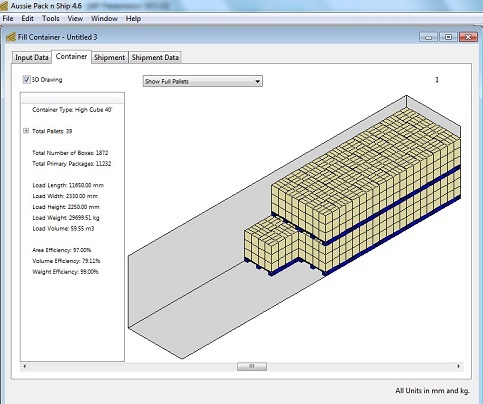 Then by assessing the box (shipper), you can determine optimal pallet utilisation. Alternatively you may only require pallet loading configurations to satisfy your supermarket clients. If you wish to see how your product can be packed into shipping containers or some other type of receptacle, press a button and you have many options of packing this and other products into any size shipping container. The program has far too many facilities to mention here. We listen to our clients and in most cases, where a client’s needs aren’t available, we will build a solution into the program. Often this can be done a no extra cost to the client. We will be happy to provide you with a free download of Aussie Pack’n’Ship. Maybe you just want to get the occasional pallet stacking pattern, configuration or layout for your pallet load, or for loading a shipping container? We can provide a very cost-efficient and convenient way for you to access this information quickly.